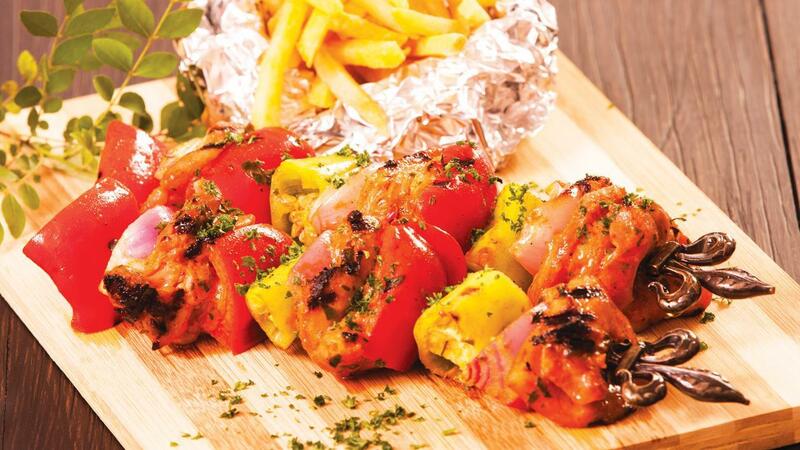 Kebabs where created by the Turkish but now traditional as well as fusion recipes are famous all around the world. The perfect spice blend along with Knorr Chicken Seasoning Powder and yoghurt ensures a juicy, mouth-watering chicken kebab every time. Try this recipe today! Soak wooden skewers for 30 minutes before skewering. Whisk together the Knorr Chicken Seasoning Powder, oil, Knorr Lime Seasoning Powder, yogurt, garlic, pepper, tomato paste, curry leaves, chili, cinnamon, and cardamom in a large bowl. Add the chicken and toss to coat; transfer the chicken mixture into a large plastic bag; refrigerate at least 4 hours. Preheat an outdoor grill for medium-high heat and lightly oil. Thread the chicken, onions, capsicums and pepper onto skewers. Cook on preheated grill until the chicken is golden and no longer pink in the center, about few minutes each side. Sprinkle the parsley over the skewers.